Chaletneuf du Tenne is a stunning modern chalet with elegant design and luxurious features such as an indoor heated swimming pool. An ideal holiday home for family groups, the chalet offers 5* luxury for up to 8 adults + 6 children. Chaletneuf du Tenne is without doubt one of the finest chalets in the area, with unrivalled position and luxuries abound. A beautifully designed property with elegant interiors, it’s a wonderful mountain retreat for families or groups of friends. Situated above Châtel, Chaletneuf du Tenne is one of the highest chalets in the area with spectacular views in all directions. It’s just two minutes drive to the nearest chairlift and you can ski back to the door from the Super Châtel ski area. The living area features wooden beams, a double aspect fireplace and huge windows, creating a light, inspiring, and homely space. Quality fabrics, chic designer pieces and stylish antiques combine to offer the perfect balance of style and comfort. The dining room is beautifully designed with a double height ceiling up to the beamed roof of the chalet. When lit up in the evenings it creates a magical setting for a delicious meal with friends. Chaletneuf du Tenne can sleep up to 8 adults and 6 children in four exceptionally large bedroom suites. The two master suites at the front of the chalet are over 6 metres long and feature en-suite shower rooms, seating areas, built in wardrobes and balconies overlooking the valley. The king sized beds can be arranged as doubles or twins. The two family suites have plenty of space for everyone, featuring super king sized beds and kids dens, which can sleep 2 or 3 children. Built using reclaimed old wood, these annexes to the main bedroom provide perfect sleeping and playing areas for the children. The family suites also offer en-suite bathrooms and seating areas. The bathrooms are all en-suite, featuring deliciously deep baths or deluxe walk-in showers. Each bathroom is stocked with thick fluffy towels, dressing gowns, hair dryers and straighteners, and Molton Brown products. The beautiful indoor heated pool is an ideal place to relax after a day on the slopes, and comes complete with jets, contra-flow swim system and French windows leading onto a sunny terrace overlooking Châtel, the Abondance valley, and across the border into Switzerland. For entertainment there’s a separate TV room situated just off the lounge, featuring comfy sofas and a 47-inch TV with Sky channels and Apple TV. Food and wine is taken most seriously at Chaletneuf du Tenne and if you’re staying with us on a fully catered basis you’ll enjoy the services of a highly skilled professional chef and a carefully designed menu to delight even the most serious of foodies! Self catered ski holidays are also available, with additional extras available such as pre stocked fridge or evening meal deliveries. Chaletneuf du Tenne is ideally situated just below the Super Chatel ski area so it’s possible to ski right back to the door via an easy path. In the mornings take your pick from a choice of starting points – the nearest chairlift is a two minute chauffeured drive, and your team of staff will always be happy to advise on best routes and mountain restaurants. Would you like to know more about this chalet? Fully Catered - Whats Included? At NINE & TENNE we are proud to feature the finest collection of chalets in Chatel, and our passion for exceptional service makes our holidays truly unique. Self Catered - Whats Included? 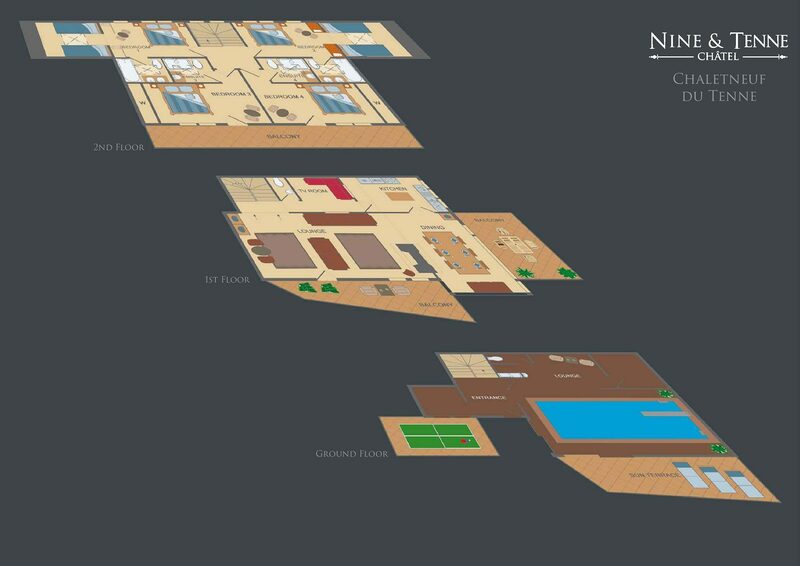 In-resort concierge service, your NINE & TENNE resort manger is always on hand to answer any questions.